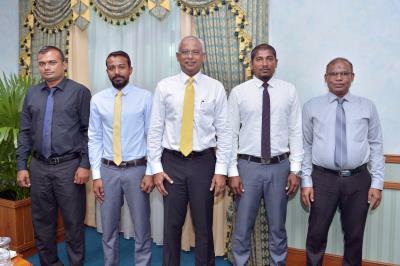 President Ibrahim Mohamed Solih has met with the members of Dhehvadhoo Island Council this afternoon at The President’s Office, and discussed the priorities and concerns raised by the island’s residents, as well as various development projects the council members have proposed for the benefit of their constituents. During the meeting, council members noted that the lack of adequate water and proper sanitation systems as a major priority issue in Dhehvadhoo Island, and further noted that the island will also require a water treatment plant along with the sanitation system. They also expressed that the residents are confronting occasional electricity stoppages and that the residents’ calls for improved ferry services, better policing, and more sports and recreation facilities for the youth. The President responded positively and noted that ensuring that development reaches all islands throughout the entire country is a high priority of his government; and that this will entail providing all islands with quality infrastructure, as well as facilities that will ensure that their residents can comfortably meet their needs and aspirations. The President further expressed that the government would take necessary action after discussing with the line ministries and address the specific issues and concerns raised by members of the Dhehvvadhoo Island Council.